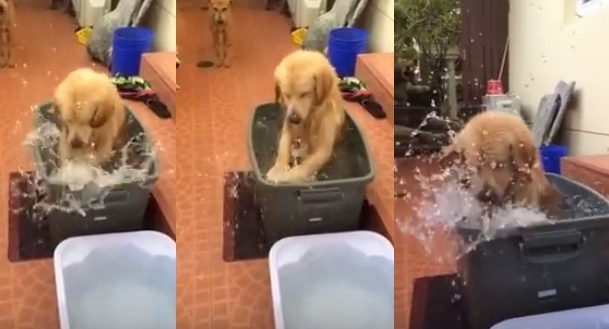 Adorable Golden Retriever Splashing In Tub Is The Best Thing You’ll See Today! While some dogs do not usually enjoy being cleaned as much as they enjoy getting dirty, this Golden Retriever couldn’t be more relaxed and happy to take a bath. In the video, the adorable pup lounges in the tub outside his home and suddenly starts splish-splashing around. He turns bath time into playtime, acting like he’s digging in the water. We imagine that within a few minutes, there won’t be much water left in this tub. Golden Retrievers are lovable, well-mannered, intelligent dogs with a great charm. They are easily trained, and always patient and gentle with children. Charming, devoted and self-assured, they are a popular family dog. Energetic and loving, Golden Retrievers enjoy pleasing their masters, so obedience training can be very rewarding. Responses to "Splish Splash! Golden Retriever Couldn't Be More Happy About This Bath"
Lovely, its nice to see our companions enjoying the summer!